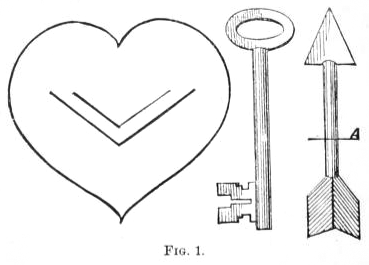 Cut out of card-board a heart, dart, and key, somewhat similar to those shown in Fig. 1. (template below) only about twice the size. The black lines on the heart represent slits cut with a sharp knife or pair of scissors to form a tongue, which can be moved up and down. The head and feather of the dart should be considerably larger across than the hole cut out of the key handle. 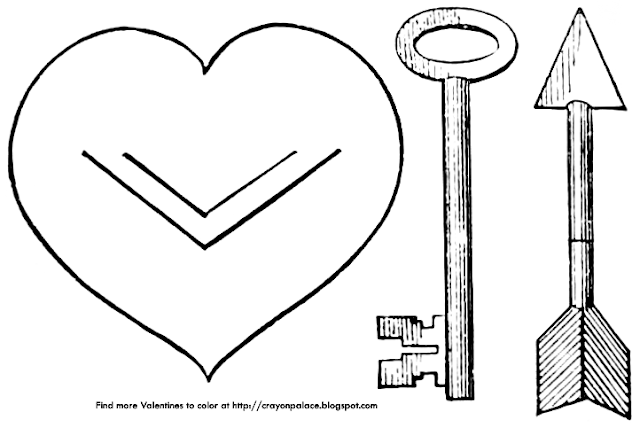 The puzzle is to link the pieces together as shown in Fig. 2. The pieces may not be torn, rolled, or folded; but the dart has to be bent across the middle of the shaft (about at A in Fig. 1). Bend the heart as in diagram Fig. 1., so as to cause the tongue to rise up. 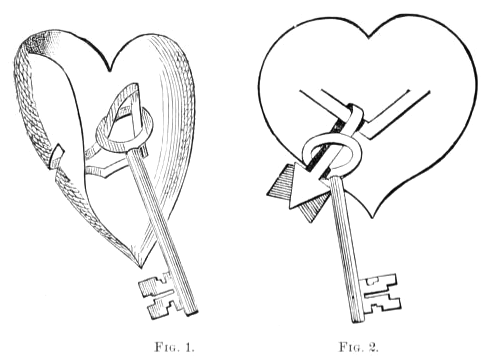 Next pass the hole in the key over the loop formed by the tongue, as shown in the diagram. Then push the head of the dart gently through that portion of the loop which looks in the diagram like the upper part of the letter A. The heart is then to be flattened out again. This also solves tongue, dart, and ring. 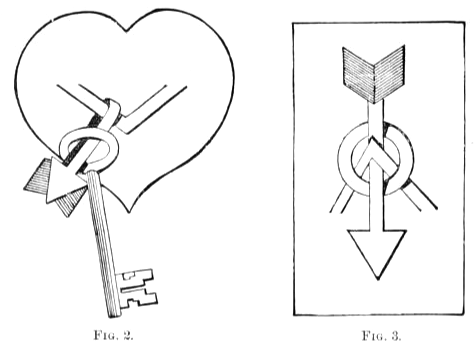 To complete the solution of heart, dart, and key, the shaft of the dart is now to be bent or folded, and pushed through the hole in the key. If the key is drawn down the folded shaft if the dart, it will hang as shown in diagram Fig. 2. Above is a free pattern of the Heart, Dart, and Key puzzle.